Bristol Road Bridge No 80 is a minor waterways place minor waterways place place on the waterways major waterways place village town city on the Worcester and Birmingham Canal (Birmingham to King's Norton) between New Selly Oak Junction (Junction with re-aligned and restored Dudley No 2 Canal) (a few yards to the northwest) and King&apos;s Norton Junction (Junction of Stratford and Worcester and Birmingham Canals) (2 miles and 3½ furlongs to the southeast). 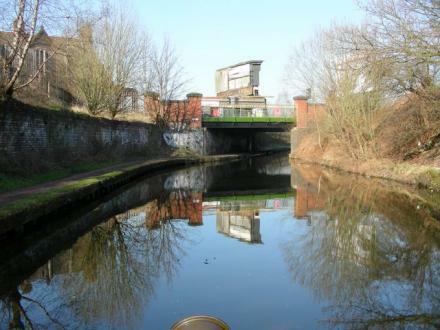 The nearest place in the direction of King&apos;s Norton Junction is Selly Oak Winding Hole (The entrance to the works basin (infilled) is opposite, under the Towpath Bridge No 79C. ); 1½ furlongs away. Birmingham Research Park, Vincent Drive, Edgbaston,, Birmingham, B15 2SQ — 1414 yards to the north. Weoley Park Rd, Birmingham, B295 — 1632 yards to the west. Birmingham — 1446 yards to the northwest. Birmingham — 1325 yards to the southeast. Birmingham — 1598 yards to the southeast. Birmingham, B15 2 — 1158 yards to the north. University of Birmingham, Edgbaston, Birmingham, B15 2TT — 1054 yards to the northeast. University of Birmingham, Edgbaston, Birmingham, B15 2TT — 959 yards to the northeast. Living, University Centre, University of Birmingham, Birmingham, B15 2TT — 1111 yards to the north. Guild of Students, Birmingham, B15 2TU — 1066 yards to the northeast. 3A Teignmouth Road, B297BA — 592 yards to the east. 672 Bristol Road, Selly Oak, B29 6BJ — 136 yards to the northeast. International Team, External Relations, The University of Birmingham, Edgbaston, Birmingham, B15 2TT — 1225 yards to the northeast. Birmingham — 1377 yards to the southeast. Birmingham — 1585 yards to the south. Selly Oak Industrial Estate, Elliot Road, Selly Oak, Selly Oak, B29 6LR — 332 yards to the south. 491-493 Bristol Road, Birmingham, B29 6AU — 711 yards to the northeast. university of birmingham, Birmingham — 1106 yards to the northeast. Birmingham, B29 6 — 257 yards to the southeast. University Rd W, Birmingham, B15 2 — 1066 yards to the north. Battery Park, Selly Oak, Birmingham, B29 6ST — 179 yards to the southwest. Unit 10, 18 Selly Oak Shopping Park Aston Webb Boulevard, Birmingham, B29 6SQ — 470 yards to the northwest. Selly Oak — 435 yards to the southwest. Bournville — 1476 yards to the south. selly oak, Birmingham, B29 — 1153 yards to the southwest. Linden Road, Bournville, B30 2LU — 1612 yards to the south. 1528 yards to the south. International Development Department, University of Birmingham, Edgbaston, Birmingham, B15 2TT — 1234 yards to the northeast. Centre for Computational Biology, University of Birmingham, Haworth Building, Birmingham, B15 2TT — 1225 yards to the northeast. Birmingham — 1607 yards to the south. Birmingham — 1523 yards to the southeast. 638 Bristol Road, Birmingham, B29 6BJ — 260 yards to the northeast. Birmingham, B15 2 — 1193 yards to the north. Birmingham — 1066 yards to the northeast. Politics Society, Guild of Students, University of Birmingham, Edgbaston, B15 2 — 1066 yards to the northeast. 931 yards to the northwest. Dame Elizabeth Hall, B30 1UA — 1484 yards to the south. Edgbaston Park Rd, Birmingham, B15 2TU — 1121 yards to the northeast. Birmingham, B29 7 — 1239 yards to the east. Twitter: @TheTab, Birmingham — 410 yards to the northwest. University of Birmingham Guild of Students & The Vale Village (Shackleton), Birmingham, B15 2TU — 1160 yards to the northeast. Birmingham, B17 0PS — 1120 yards to the northwest. Bristol Road, Selly Oak, B29 6NA — 102 yards to the south. Olton — 1337 yards to the east. 350 Bournville Lane, Bournville, B30 1QY — 1251 yards to the south. University of Birmingham, Edgbaston Park Rd, Birmingham, B15 2TU — 1119 yards to the northeast.